The period in Western European history between the fifth and tenth century are often called the “Dark Ages,” though contemporary historians tend to push back on this. It’s true that social organization changed radically, in many ways for the more chaotic and violent, after the fall of Rome, and much of philosophy was lost to the Latin world; but technology continued advancing, with the stirrup and the horse collar only appearing in this period. Still, advanced concrete really was one of those things that people forgot how to make, vanishing from the West in the 5th century and not reappearing until the 14th, which makes this strip anachronistic. Maybe the newfangled poured stone was a (re)invention by this particular craftsman, who found himself promptly murdered by the local viking chieftain for annoying him, leaving Europe concreteless for hundreds of years to come. 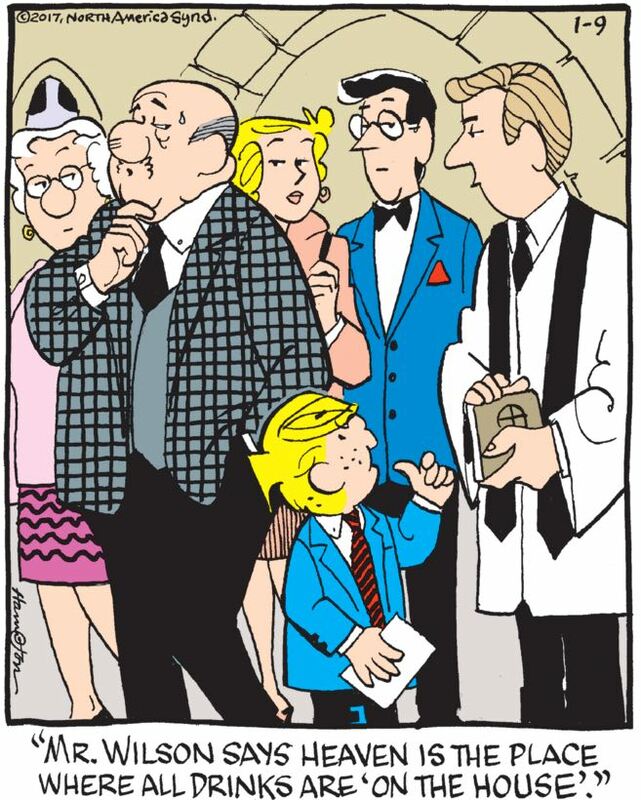 This strip is also a great example of how character design can really screw with a visual gag. Lucky Eddy always wears a long robe (cloak?) that goes down to his ankles; logically it should have dragged through the wet cement, but instead it looks like he’s hopping and making cloak-sized holes. In our previous discussion of “just what religion are the Mitchells, anyway?”, we settled on high church Episcopalian, probably, and I dunno, maybe this is a cultural stereotype, but I don’t think the Episcopalians are gonna be that upset by the idea of Heaven as having an eternal open bar. Does Mary Worth understand sarcasm? Does she know that “Good luck with that!” is usually sarcastic? I can never tell with her. Anyway, I too wish Iris a non-sarcastic good luck! Good luck not thinking about Wilbur at all! It’s easy if you try!